Anonymous, Westerners Playing Music (detail) (Momoyama, c 1600), colours on paper, six-fold screen, 93 x 302 cm, Eisei Bunko Museum, Tokyo. Wikimedia Commons. It was very fortuitous that the first Europeans should start to arrive in Japan from 1543 onwards. At the time, the Japanese state had collapsed into disarray, and warring factions welcomed foreigners who could sell them large quantities of muskets and other weapons. Although the Europeans – Portuguese and Spanish in the first instance – were initially driven to expand trade, with that they seized the opportunity to earn their places in heaven, by introducting Christian missionaries to this ‘heathen’ country. So as the merchant ships brought as many muskets as they could squeeze into their holds, to help the Japanese kill one another, they also brought Catholic missionaries to save their souls. In sixteenth century Japan, the dominant school of painting remained that of Kanō, whose founder Kanō Masanobu (狩野 正信) died in 1530 at the age of 96. Creating mainly folding screens made of paper, these traditional painters used inks and colours similar to Western distemper, with animal glue binder and water as the diluent. During the sixteenth century, gold leaf became popular as the medium for depicting the stylised ‘mist’ which commonly separated motif elements. Little or no use appears to have been made of flax for the extraction of drying oil, nor does there appear to have been any use of manufactured linen as a painting support. Flax had become domesticated in China by about 5000 BCE, and almost certainly was farmed in Japan soon afterwards. Linen was widely used for the production of garments, but lessened in popularity when the cotton plant was brought to Japan in about 1500. There are some unsourced reports that perilla and tung oils were sometimes used as drying oils in paints, but by 1550 such practice appeared very rare. In Europe, the dramatic changes in painting brought about during the Renaissance were coming to an end, and 1600 is normally taken as marking the start of the Baroque, bringing further refinements in oil painting, the popularity of portraiture, development of landscape as a genre (albeit a humble one at that time), and the use of rich colour and wide tonal range, as in the chiaroscuro typical of Caravaggio (1571-1610) and his followers. Two types of painting arose in Japan as a result of European trade and missionary work: mainly religious works within Christian missions, and a novel secular genre in existing Japanese workshops. A small number of painters copied and elaborated on the European religious paintings brought by the missionaries, some Japanese being taught Western painting techniques within the educational programmes of the missions. This small ‘school’ of painting does not seem to have attracted a distinctive name, and very few of its paintings remain. Anonymous, Portrait of Saint Francis Xavier (Momoyama, c 1600), colours on paper, 61 x 48.7 cm, Kobe City Museum, Kobe. By User 鹿両性証明 on ja.wikipedia, via Wikimedia Commons. 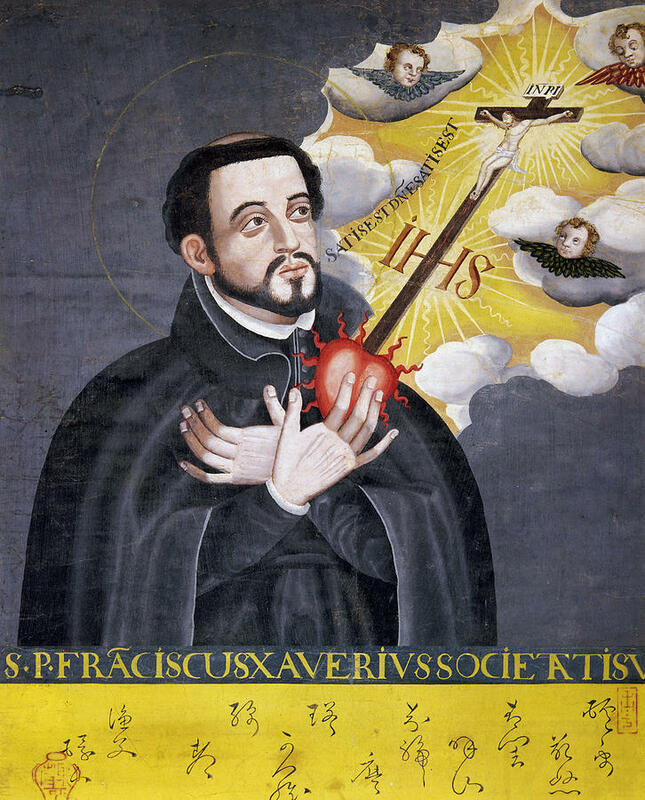 Among those survivors is this rather naïve Portrait of Saint Francis Xavier (Momoyama, c 1600) by an unknown artist, who Kang argues was not Japanese. It is though remarkable for being one of the first realist portraits painted in Japan, and for bearing both Japanese characters and a Roman inscription, which I think strengthens the case that it was painted by someone whose first language was Japanese. The painter had either not seen Western putti, or preferred to invent their own, consisting of lifelike heads mounted on more symbolic wings. Anonymous, The Fifteen Mysteries of the Rosary (detail) (Momoyama, c 1600), colours on paper, 75 x 63 cm, Kyoto University, Kyoto. Wikimedia Commons. Again by an unknown artist, The Fifteen Mysteries of the Rosary (of which I can show only the lower half) attempted a more complex, but still thoroughly missionary, subject. As with other works which were probably painted in missions, its contents appear to be a pastiche of copies: the woman on the right has a curiously Roman appearance, for instance. 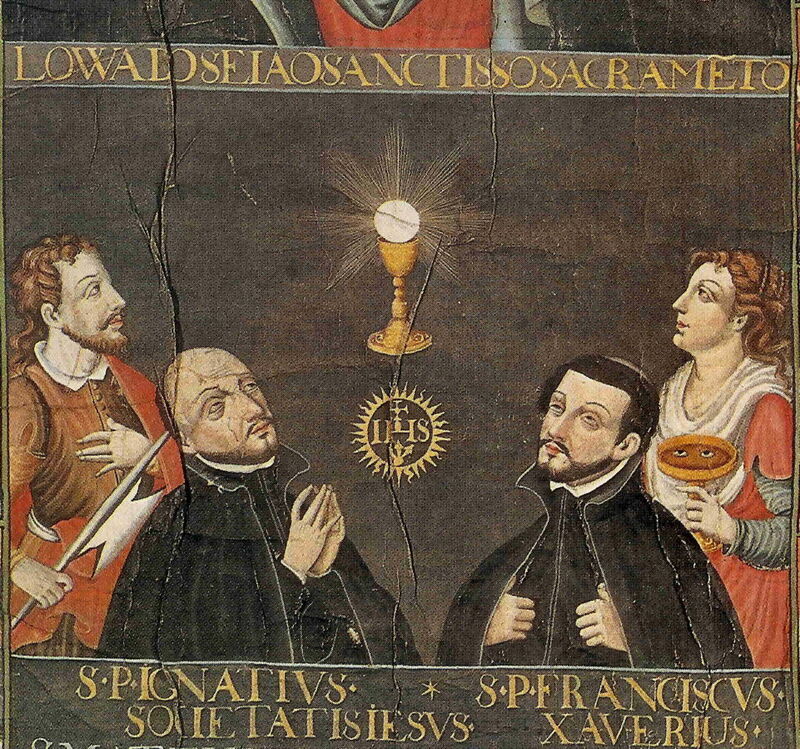 The inscription identifies the man on the left as Saint Ignatius of Loyola, co-founder of the Society of Jesus (Jesuits), and the man on the right as Saint Francis Xavier, another of the co-founders. Anonymous, Saint Peter (Momoyama, c 1600), oil on cloth, 119 x 69 cm, location not known. Wikimedia Commons. 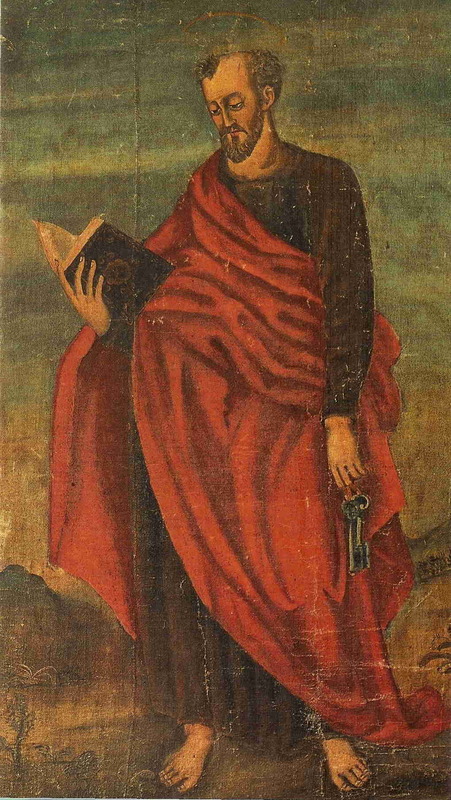 Inevitably depictions of the Holy Family and saints were included, here Saint Peter, rendered in oil paint on cloth. A few other works from this period are known to have used oil paints, and some used conventional Western canvas supports. Written records state that Western painting using oils and watercolours was taught in schools in the missions, and there was print-making using copperplate etching too. A few of those prints have survived. Records also give names to some of the painters who were active, which imply that they assumed names appropriate to their new religion and art. These included Pietro Giovanni (b 1566), Leonardo Kimura (c 1574-1619), Jacob Niwa (b 1579), and Nobukata, to whom a few paintings are now attributed. Several of these had itinerant careers, with records tracing them to missions in China and Macao, and one (Kimura) was martyred by being burnt at the stake. More numerous were paintings by established traditional Japanese artists which recorded the arrival and influence of the Europeans: Kang considers that about 60 have survived from the period of their production from 1593-1680. Because the Europeans were termed ‘Southern barbarians’ 南蛮人 namban-jin by the Japanese, this genre of Japanese art is known as namban or nanban (南蛮). Most examples of this genre are folding screens, namban byōbu (南蛮屏風), which can be quite spectacular. These were painted using the standard media of ink and colours, and sometimes gold leaf, on paper. Kanō Naizen (狩野 内膳) (1570-1616), Namban screen (Momoyama, c 1600), colours and gold on paper, six-fold screen, 154.5 x 363.2 cm, Kobe City Museum, Kobe. Wikimedia Commons. Kanō Naizen (狩野 内膳) (1570-1616) was an established master of the Kanō school when he painted this Namban Screen (Momoyama, c 1600). Like many others, it features a Western sailing ship in the sheltered waters of Nagasaki harbour, a European crew on board. The quayside has other Europeans and trading goods, and there is a long pedestrian procession of Europeans and their attendants through Japanese dwellings and shops. Kanō Naizen (狩野 内膳) (1570-1616), Namban screen (detail) (Momoyama, c 1600), colours and gold on paper, six-fold screen, 154.5 x 363.2 cm, Kobe City Museum, Kobe. Wikimedia Commons. This detail shows some of the stereotypical features associated with these Southern barbarians, with moustaches and small beards, long pointed noses, hats, ruffs, and voluminous trousers. However, quite unusually for Kanō school paintings (and for traditional Japanese painting as a whole), the faces are not flat areas of colour, and some shadows are shown in them, although as usual cast shadows are omitted throughout. There is no attempt to model the figures in more detail, and those of Japanese in the background are more traditional in appearance. Other conventions of Western realism, such as sky and water detail, continued to be treated traditionally. So at least in these genre paintings, Japanese artists had altered their style. Anonymous, Westerners Playing Music (Momoyama, c 1600), colours on paper, six-fold screen, 93 x 302 cm, Eisei Bunko Museum, Tokyo. Wikimedia Commons. Some of the screens which have survived are more puzzling. 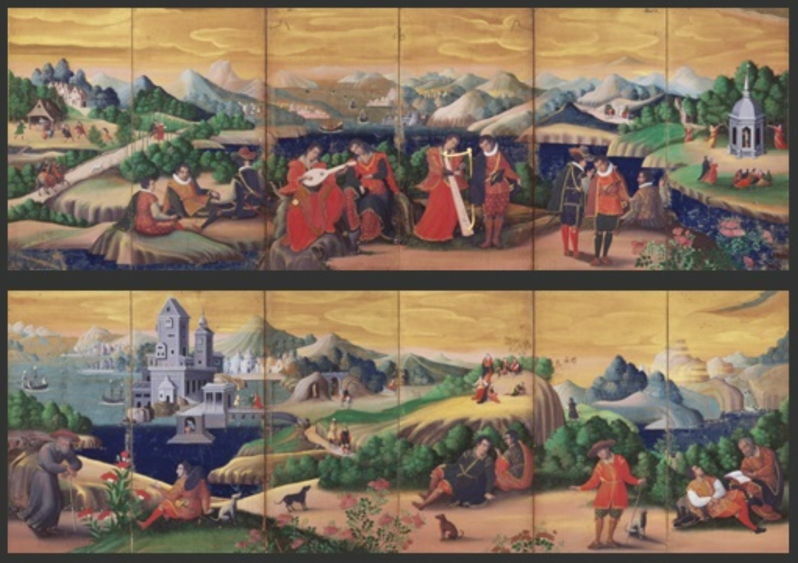 This anonymous work, Westerners Playing Music (Momoyama, c 1600), appears to have been composed of elements copied from Western paintings, and is remarkable for adopting quite a Western style, even if the sky is rendered using gold leaf. Experts consider these to be later works, which progressively include more non-Japanese content and locations. This detail shows how Western are the techniques and style employed, with delicate shading and shadow in flesh, and folds in fabric which are modelled in a very European manner. 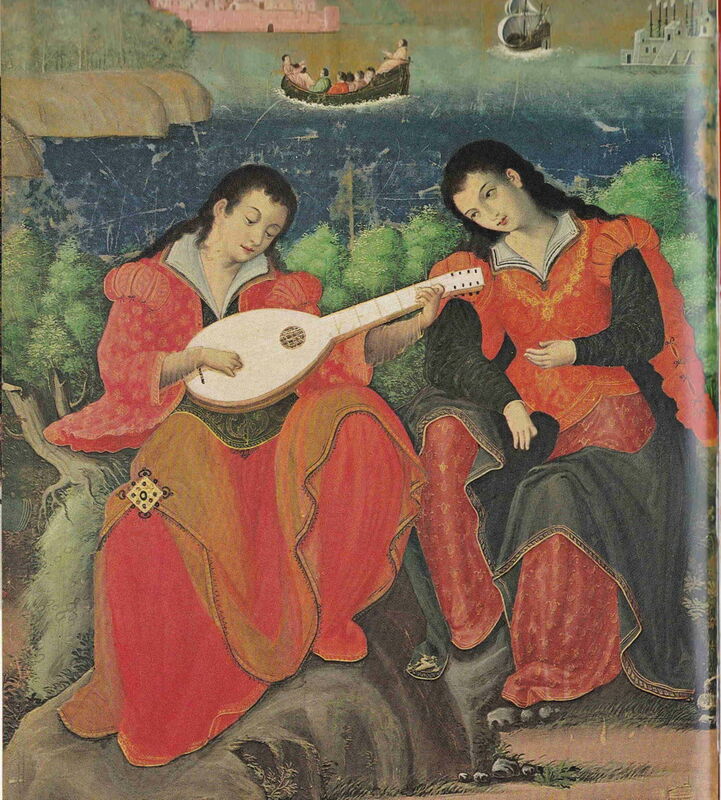 The lute player here is a curiously popular figure: one of the surviving paintings attributed to Nobukata shows an almost identical musician, and there is a second screen containing essentially the same figures and landscapes too. Other screens include world maps with miniatures showing the major cities of Europe, and an extraordinary composite showing the Battle of Lepanto (in 1571, a key victory to the Hispanic traders and missionaries) welded to a copy of Giulio Romano’s Battle of Zama, showing Hannibal’s elephants at war (in 202 BCE). Screech argues that this was a perfectly logical anachronism for a Japanese painter to create. 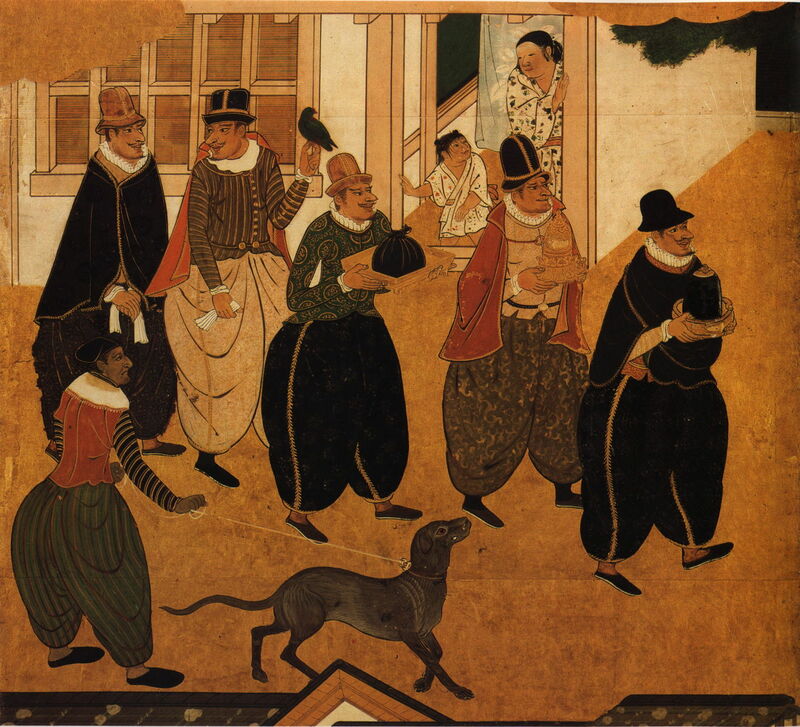 Kanō Sanraku (狩野 山楽) (attr) (1559-1635), Western Kings on Horseback (Momoyama, c 1600), colours on paper, four-fold screen, 184 x 145 cm, Suntory Museum of Art, Osaka. Wikimedia Commons. 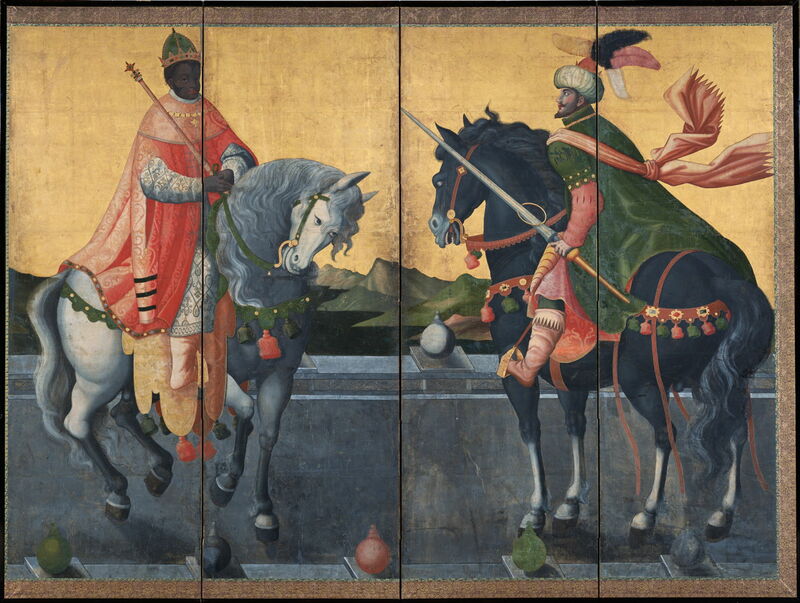 A final group of screens features regal and courtly European figures, such as Western Kings on Horseback (Momoyama, c 1600), which is attributed to Kanō Sanraku (狩野 山楽) (1559-1635), another Kanō master. This illustrates well how the Japanese artists of the day were able to mimic the elements of Western style, even showing some tentative cast shadows under the horses, but as they did not understand the projection necessary for ‘correct’ linear perspective, that was inevitably incorrect to some degree. But not quite: although the Catholic traders and missionaries were expelled, Japan was not left entirely isolated. A peninsula in the bay of Nagasaki was separated from the mainland by digging a canal, and Dutch merchants were allowed to remain there, their vessels (and those of the Chinese) still permitted to use Nagasaki port. They were responsible for the second period of Westernisation, from 1638 to 1853, which I shall cover in the next article in this series. Posted in Painting and tagged byobu, folding screen, Japan, Jesuit, Kano, namban, nanban, Nobukata, perspective, realism, Western style, Xavier. Bookmark the permalink.